Before you start remember these three important ground rules. 1. Never connect power (attach battery) to your AA circuit unless you have already connected LEDs to the orange and green wires properly. Neglecting this rule will damage you circuit. 2. Connect no fewer than 7 LEDs to this AA circuit. Powering fewer than 7 LEDs will send too much current to each LED and most likely damage or burn out the LEDs. 3. Never connect power (attach battery) to your AA circuit in the reverse polarity. This WILL damage you circuit. Here is a diagram showing basic connections: Click circuit diagram picture to enlarge. For this you will need an existing ProdMod LED hoop and the AA Battery Upgrade. You can buy the upgrade here. Pull out the switch from your LED hoop and also pull out both the positive and negative wires that lead to the LEDs. Connect the orange wire to the positive LED wire. If you followed my LED hoop making instructions the wire from the switch should be positive. So remove it from the switch and connect it to the orange wire. If you made your hoop, you will have to know which wire is positive. The other wire from the LEDs, should then be your negative wire. Cut your negative LED wire so that you can attach it to the the green wire of the AA circuit. Now you still have wire in your tube leading to the battery area. Connect that remaining wire to the black wire of the AA circuit so that it reaches through your tubing connector and into the battery area. That is your negative battery wire and must connect to the negative part of the battery holder you will attach later. The red wire from the AA circuit must attach to the switch. And the other side of your switch should already be connected to the remaining wire leading out through the connector and to the battery area. That wire must be lead to the positive side of the battery. After connections are made you can push the AA circuit in through the switch hole and seat the switch. The remaining wire on the other side of the tube connector must be attached to the battery holder with the correct polarity. Your battery holder now replaces your old non-rechargeable battery. Whatever you do, make sure that the red wire of the battery holder is leading to the red wire of the AA circuit. See diagram. Never connect power with reverse polarity. For this you will need a Maker Kit with the AA module and battery holder. You can buy the kit here. 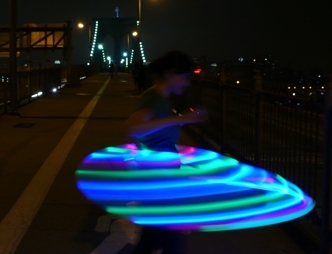 Begin assembling your hoop by following the standard LED hoop instructions like you normally would up to and including Step Eight. But before fishing the wire through in Step Nine, you could connect only the AA circuit (orange and green) to the appropriate polarity of the LED wire just after your last LED where the switch would go. Then take some extra wire (used for you LEDs) and connect the other end of the AA circuit (red and black) to the proper polarity of that extra wire. Usually the clear wire with a white strip is negative and the other is positive. Those extra wires from the Red and Black side of the circuit is what will eventually connect to the battery holder. But don’t attach the battery holder yet. Now you can fish that new wire through the tube as you normally would. But at Step 10 you must be sure to pull the red wire through the switch hole and connect the red wire only to the switch as shown in the diagram. Add the connector in Step Eleven. Then in Step Twelve, instead of attaching a plain battery you will be attaching the battery holder. can a lithium battery be used with this setup? does the other side of the led wire (the one that was not labeled and has no slack) come into play anywhere? or should i just leave that end alone? We are thinking about using 30 LED’s… Would you need a more powerful battery, or more than one battery to power more LED’s? (Digital camera rechargeable?) We want to be able to throw in rechargeable batteries on the go. I normally hoop with the 5/8″ HDPE tubing. Could I use this kit with the 5/8″ tubing? Does this mean that during when you are attching the LEDs to the wire you have to have at least 7 attached before you to test the LEDs? Because I have just been trying to test the one (before reading this bit!) and it did not light- so I should just do 7, and then test them? I just attached about ten LEDs to my wire and tested them, and again, nothing happened. However I just read something about not attaching the battery unless you have the orange and green wires sorted. So does this mean I have to wait until I get to this stage to test anything? 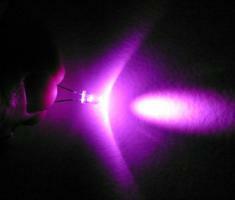 You can power one LED with this circuit as long as its just for a quick second. You just dont want to leave it connected to less than 7 LEDs. If it did not light your first LED then something is wrong. The positive side of the battery has to be connected to the red wire, negative side of battery to the black wire. And the orange wire connects to the positive side of the LED, Green connects to the negative side of the LED. you can make these connections temporarily, for testing LEDs, by twisting the wires together as needed. Hi, I was wondering what sort of circuit module you are using in this setup. Could you explain what this part does? i am also curious as to what the circuit module does and why dont you need it for your basic hoop circuit using the regular (nonrecharging) battery? This little circuit boosts your 1.2V or 1.5V AA battery up to around 3 Volts so that you can power the LEDs. The non rechargeable battery is already 3.6V so it doesn’t need a boost circuit. Interesting — so couldn’t you just link two AA batteries together instead? is there a benefit to using the circuit module? Space and voltage. 2 batteries dont fit in tube next to each other. So you’d have to place them in series which takes space away from your leds. this all seems very do able. but where do i find the circuit module? What is the optimum nuumber of LEDs to use with your AA MOD to get the best brightness from your LEDs and the longest battery life? i just received my kit in the mail and there was no tube connector. where would i buy on for my tubing? Hi Lindsey, if you purchased the upgrade it is not intended to include a connector. All upgrade kits on this site are for those you have already built a hoop and therefore already have the connector. If you in fact bought a maker kit and do not see a connector then please email me at prodmod@prodmod.com. In regards to finding a connector nearby I have only seen these sold in some of the Lowes stores. Thanks so much! I hardly ever win gaeivways so this is quit exciting! I sent you an email so you would have my address. Let me know if I need to resend it, and thanks again! thanks i found a connector i can use, i have another question. i was in the middle of building my hoop on the floor and had all the supplies around me and my puppy got a hold of my circuit module and chewed it up. can i order another one separately from you? how much would that cost me?